So I’m doing four cooking demos at the Home and Garden show here in Sonoma County this weekend and decided to do it on Zucchini Spaghetti; an idea I came up with about five years ago. Zucchini Spaghetti was one of the first videos I did and posted on YouTube – it came to be as we had a garden full of zucchini that year and I needed to think outside the box of ways I could prepare it and thought “Well, I’ll just make it into spaghetti like threads and use it like pasta”. It was quite innovative in the day. Five years ago you didn’t find zucchini spaghetti, or as it is more commonly called now, Zoodles, in many recipes. Spiralizers were not hot commodities in the market, nor were julienne peelers. 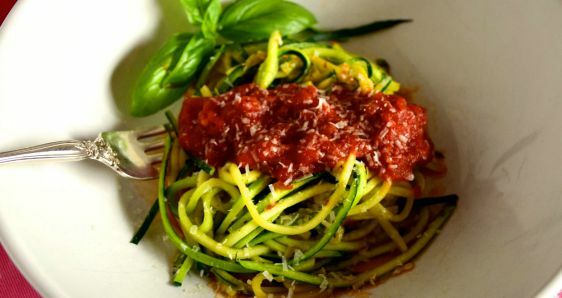 With the onset of Paleo, raw eaters, vegans, gluten free, and the meatless Monday uprising, zucchini spaghetti has become much more common in many recipes and on many recipe sites. 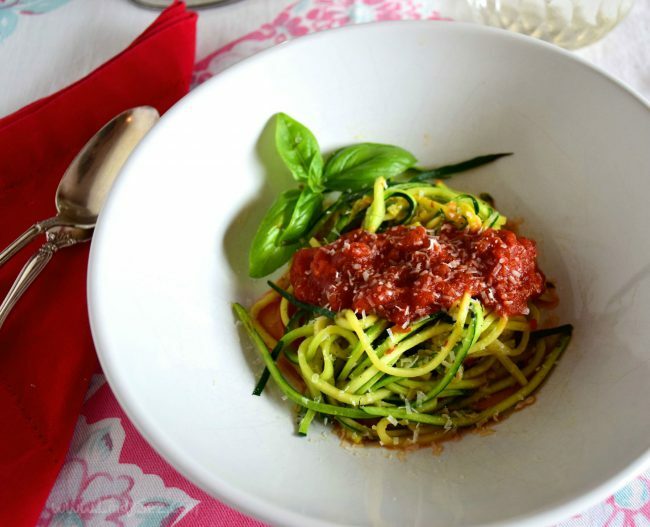 This recipe for Zucchini Spaghetti with Tomato Sauce is so easy to make, and perfect for a quick, low-fat, no-carb, gluten-free lunch or dinner, done in about five minutes. I use my mandolin to julienne the zucchini, taking only the firm outside part of the zucchini, leaving the soft middle and seeds aside. My chickens love the soft middle and seeds; but you could also use them to make a delicious soup, such as my recipe for Curry Zucchini Soup. When I made the video I did not use the hand guard and I get yelled at a lot in comments for not doing so. I didn’t use it because the prongs on the hand guard which holds the vegetable into place would have ruined one whole side of the zucchini. I know a mandolin is sharp and used great care in keeping my fingers out of the way. Now, watching back, I understand their comments better. It looks scary. So in today’s world, I do use it. But only on the second half. I hold the whole zucchini, hand very flat, and take the first side of the flesh off, then when I turn it over to do the second side, I use the guard. I don’t care if the soft middle and seeds get holes in them. Even I can learn a new trick. #1 – it cuts everything into a spiral. I don’t want my spaghetti in a spiral. I want it flat. #2 – it restricts the size. You can only put what fits on it on it. And if you have every grown zucchini, then you know, it can go from baby sized, to ginormous in a matter of days. And zucchini spaghetti is a great thing to make out of those super-sized zucchinis. #3 – it decides how much core you have left. The spiralizer will put a lot of the soft middle into the mix. A julienne peeler would be my second choice after the mandolin. The only reason I don’t use it is the size of the resulting strands are too thin. They are all right for making Raw Zucchini Salad, but even with that recipe, I prefer the texture of the noodles I make on the mandolin. 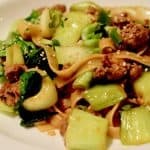 Using a mandolin, julienne vegetable peeler, spiralizer, or your awesome knife skills, cut the zucchini into strands that resemble spaghetti, leaving the soft middle and seeds aside for another use. Heat the oil in a sauté pan over medium heat; add the garlic and sauté for about 1 minutes, do not brown the garlic. Add the zucchini stands, along with a pinch of salt, and cook, tossing often, until they are tender but still have some bite (al dente) - about 3 to 4 minutes. Add the thyme leaves and red pepper flakes, if using. Toss well. 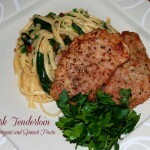 Taste and season with salt and freshly ground pepper. Place on a warmed plate, top with 1/2 cup of sauce and Parmesan cheese. 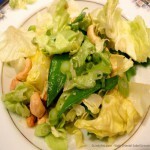 LindySez: This recipe is written for one, but it’s super to make more. Just figure one zucchini and 1/2 cup sauce per person. Then, of course, you will also increase the garlic and oil a bit to all for the additional zucchini strands. I like to make it for myself for lunch. 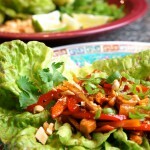 5 minutes, 145 calories? Now that’s fast food that will fill you up, not fill you out!